Romantic Evening for Two Gift Basket. This Valentine's Gift includes everything you need for a romantic evening at home. Make this year one your sweetheart won't soon forget. This gift includes the following: 3 pc votive candle gift set, Frosted glass votive candle holder, Chocoholics chocolate body frosting, 6 oz. 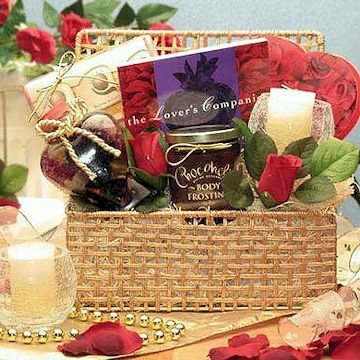 Valentine gift Box w/ assorted chocolate, Almond Body Butter Massage Lotion, The Wisdom of the Heart Love and Romance book, in a simple Golden chest. Order early and don't miss out on making a lasting impression!